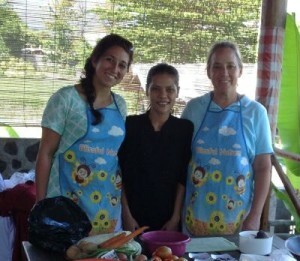 If you enjoy cooking and would like to learn how to cook Indonesian food, we offer cooking classes at Mumbul. We first take a trip to the local market, where we buy our produce for the day. You can choose from any of the dishes from our restaurant’s menu. The number of dishes will depend on the size of the class. The classes are fun and hands on. We include a free recipe book, which includes 10 Indonesian recipes. Once we have finished the cooking class, you can then enjoy eating the dishes! Price: 500,000 rupiah per person.